Bryan Spiel, Parade, South Dakota, welcomed the opportunity to see these bulls from Illinois. Robert, Jim, and Malcom Milligan own Milligan Herefords. Their ranch is located near Kings, Illinois, and their family has been in the cattle business since 1836, raising registered Herefords since 1918. They have been selling bulls in the Dakotas since 1950. 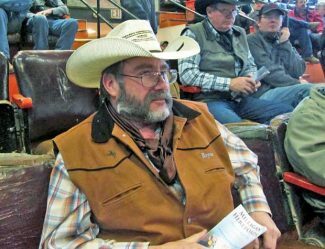 Most recently they have been marketing their bulls through the annual Philip Livestock "Bull Day" in May, and they have been part of that since it began over 15 years ago. Milligans offer stout, registered two-year-old Hereford bulls that can be used to produce baldy replacement heifers, or to add pounds to feeder cattle. These bulls are big and stout, ready for heavy service, and not overfed. The Milligans also brought to Philip some open and bred heifers. Two of the top pedigrees in the lineage of this herd are KB L1 Domino 1124, originally from Ken Baker Herefords, and a son of JA L1Domino 503 2ET, plus RJ 1056 Harland 908, a son of SR Saga 1056. Harland 908 is out of a daughter of KB L1 Domino 1124, with his pedigree back to the great Harland 408 bull. Top selling bull of the day was Lot 11, selling for $6,250 to Bud May of Kyle, South Dakota. Here was a son of HH Advance 5061R ET who was out of a daughter of CL1 Domino 1133L. Born at 83 pounds, he weaned at 719 pounds. This deep, thick, stout made bull had EPDs of BW 4.5, WW 46, YW 82, MILK 22, M&G 45, SC 1.3, REA 0.3, and MARB 0.11. Jerry Nelson, Philip, South Dakota, purchased two of the top bulls. His top selection was Lot 16 at $4,750. This big topped, thick butted bull was sired by RJKB 842 Lucky Domino 1167, and out of a daughter of RJ 1124 Gladiator 912. With an 80 pound birth weight, he weaned at 718 pounds, and posted EPDs of BW 2.4, WW 45, YW 69, MILK 16, and M&G 38. Jerry's other purchase was Lot 19 at $4,000. Here was another bull out of HH Advance 5061R ET, and his mother was a daughter of KB L1 Domino 1124. He entered the world at 74 pounds and grew to a weaning weight of 757 pounds. His EPDs included BW 2.1, WW 55, YW 89, MILK 20, and M&G 47. At $4,500, Allen Rislov, Philip, South Dakota, purchased Lot 17, a son of RJKB 842 Lucky Domino 1167, with a very high weaning weight. Born at 80 pounds, he had weaned at 893 pounds. He was deep bodied and long, with EPDs of BW 2.2, WW 35, YW 64, MILK 20, and M&G 37. Vernie Doehring, Rockdale, Texas, paid $4000 to own Lot 6, a son of RJ 1056 Harland 908. Entering the world at only 64 pounds, this deep bodied bull was out of a daughter of KB L1 Domino 1124. He weaned at 783 pounds and his stats were completed with EPDs of BW 0.7, WW 71, YW 108, MILK 19, M&G 54, SC 1.3, REA 0.49, and MARB 0.27.